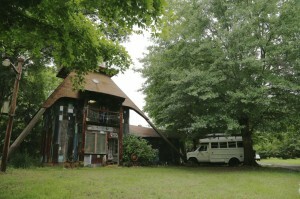 The Cosmic Shed in East Texas. 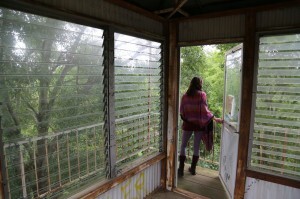 “Y’all are getting a real dose of East Texas, with a capital T,” said our host Cindy partway through our stay at the Cosmic shed. Since arriving at the Cosmic Shed, Ally and I had met backwoods rednecks, experienced a bunch of the culture, had a run-in with a local Constable, eaten deep fried catfish caught that day, and I had had an extreme allergic reaction to a sting from a red wasp. What was meant to be a day or two stay had ended up being a week before we knew it. 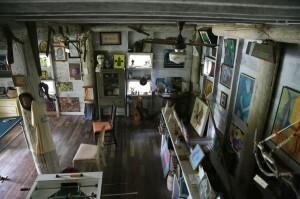 Part of it was a need to relax after a hectic couple weeks trying to prepare for the road, part of it was because we enjoyed the folks we were meeting, and part of it was The Cosmic Shed itself, and the woman who care takes it, Cindy. 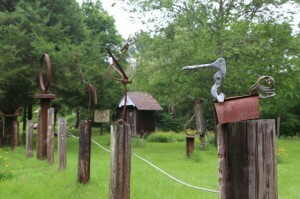 Some of the salvaged sculptures. The Cosmic Shed was built in the 1960s by a man named Fred Rogers, who shape-shifted his way through life from being a systems analyst for the Pentagon to a maker of trash art. 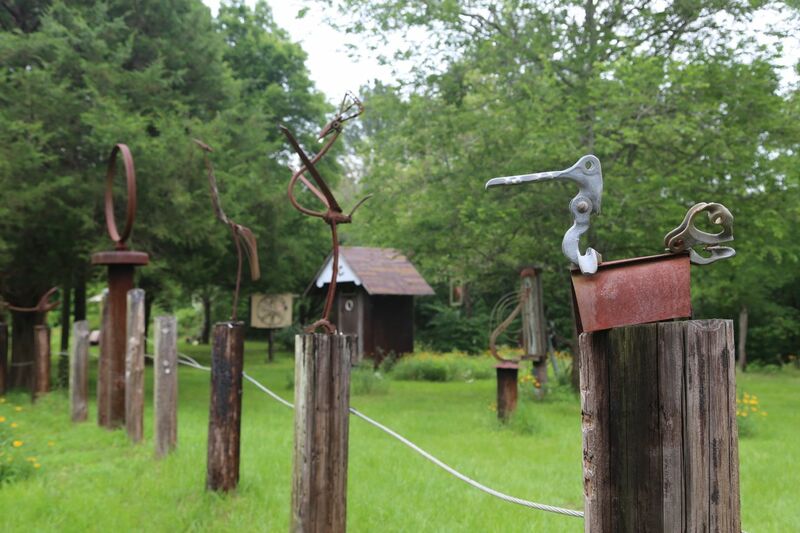 The grounds around the Shed are scattered with salvaged art, made from old appliances, machinery, and other do-dads. “Trash Sculpture – An Art Form Appropriate for Our Time” reads one sign. The Shed itself is a large four-story pyramid, reminiscent of both a tipi and a fire lookout tower. It is clad with salvaged corrugated metal of rust tones and various colors of blue automotive paint. The stairs up to the fourth floor. 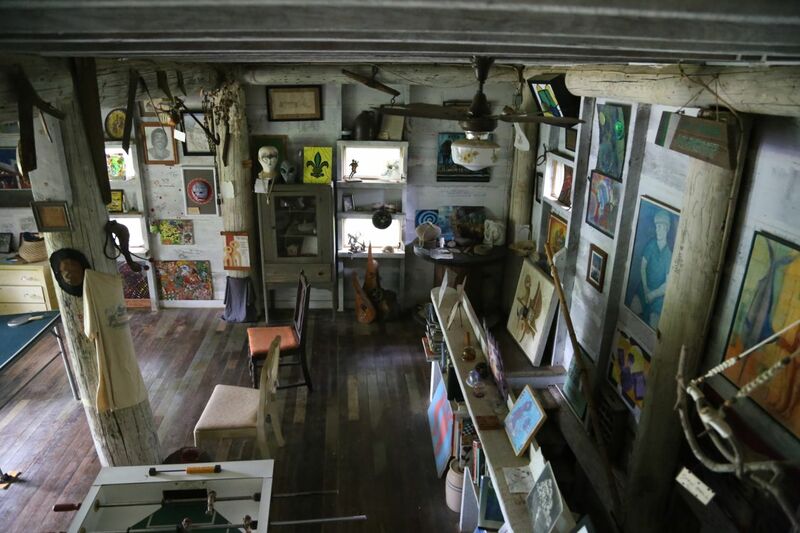 Inside the Shed, considered both an art gallery and a museum, a guest will find artwork from many artists, along with old tools, old wasp nests, and anything else deemed museum worthy. 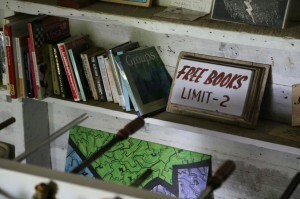 The first floor grasps your interest with the eclectic nature of items and artwork displayed. The second floor makes you feel at home amongst the madness, and allows you to interact via the Ping-Pong table, foosball table, and balcony. The awkward stairs up to the third floor up through a hatch in the floor, make you feel like you’re entering a secret hide-away. 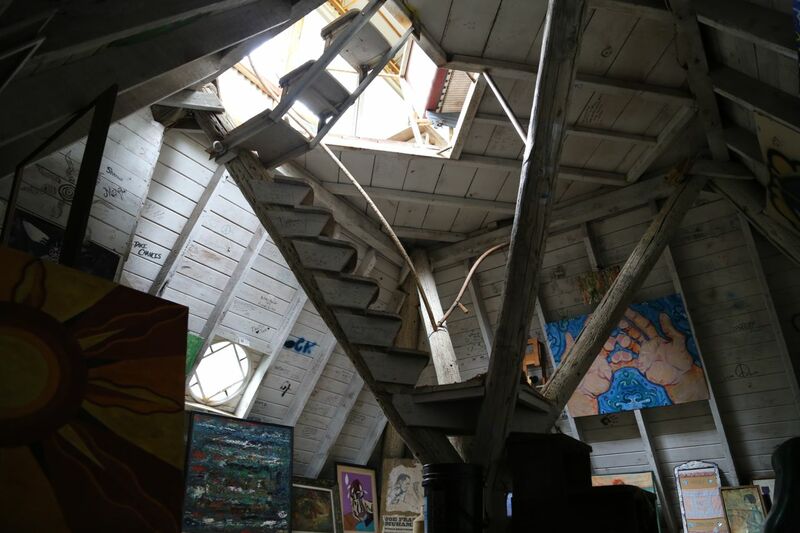 And indeed, the third floor has few windows, and the walls of the pyramid shape start to taper in, making it feel like an old attic in which you might make a secret fort. Protruding from the center of the third floor is a system of large cross-braces, which form a nest of stairs leading up towards the light beaming down from the fourth floor. Going up these small stairs, one finds themselves in a room of glass. 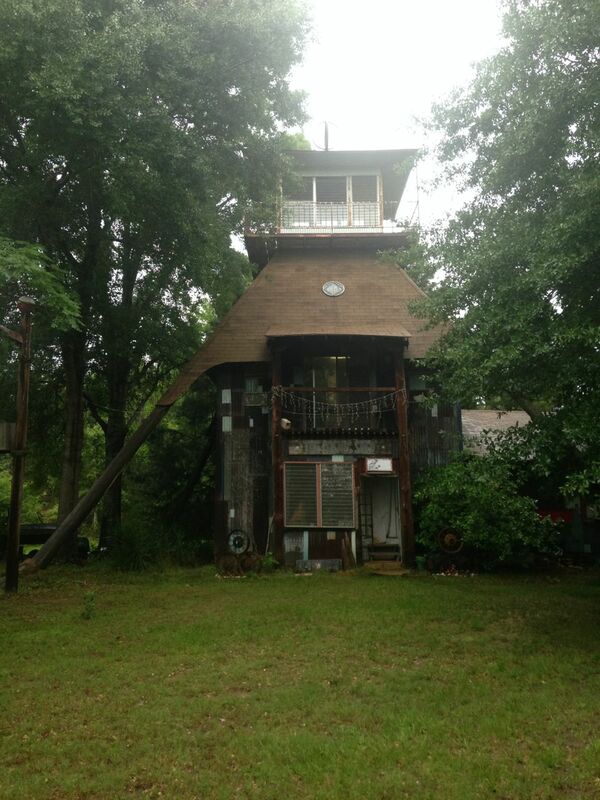 The trees have grown up in the past 50 years, making it feel more like a tree fort than a fire tower. 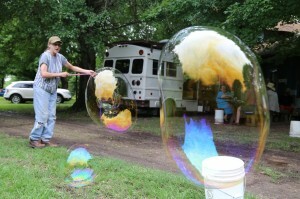 Cindy makes bubble with the kids. When Ally and I first arrived, Cindy, who was Fred’s partner, told us she wanted for us to hear the story of Fred’s death from her. When Fred was diagnosed in the early 90s with cancer, he said that he wasn’t afraid of dying, but he didn’t want to suffer. And when the suffering started, he built a funeral pyre, lit a fuse, and took his own life with a .357, while simultaneously cremating himself in front of one of his own sculptures. When talking about it later, a local police officer said, “Yup, that was Fred.” People knew him as a person who knew himself well enough to live (and therefore die) in the confidence of his own beliefs. 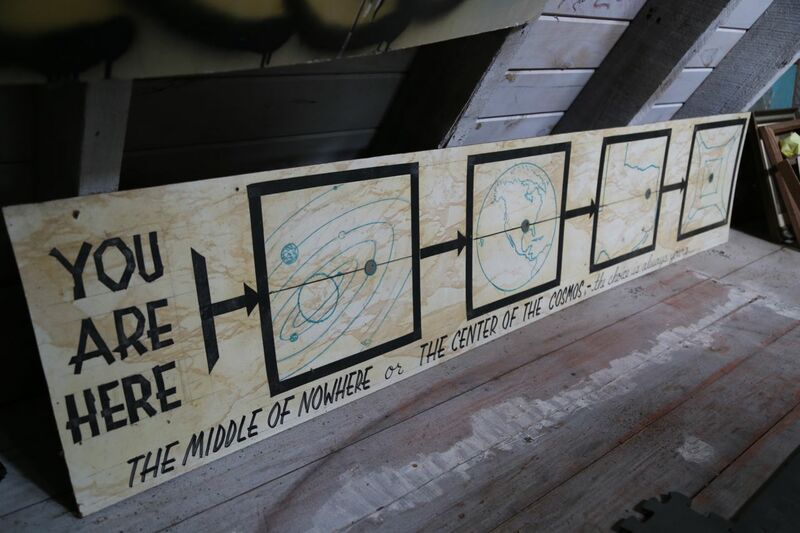 The power of the place that Fred built, and the profoundness of his death almost brought me to tears, and gave me complete respect, as well as a sense of connection to The Cosmic Shed and the man who built it. 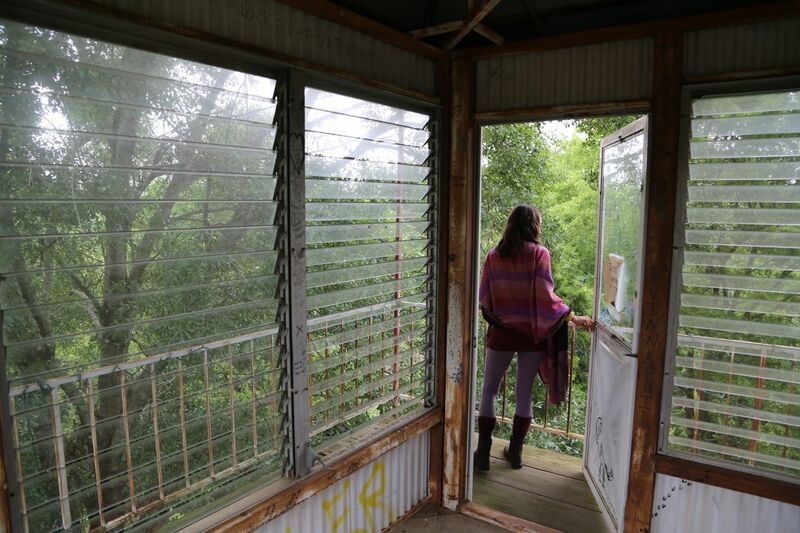 However beautiful, inspiring, and interesting the Cosmic Shed is, because it is in the heart of conservative East Texas, it isn’t always seen as proper or socially acceptable. Over the years the place has been shot at, been the source of many un-Christian rumors, and Cindy has even been accused of being a witch by a fellow whose daughter got candy from her on Halloween. The last case was settled when the fellow’s friend who was with him recognized Cindy and they ended the confrontation with a picnic amongst the sculptures. I speak about these things, not to bring any pity, but rather to show the extremes of culture present here in east Texas. 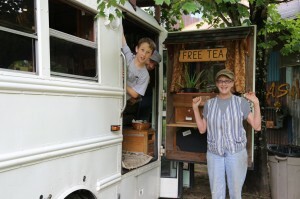 The first full day there, we had arranged to serve tea to many long-time “Shedders,” many of whom come most Sundays when the Shed is open, as well as many new-comers and folks who hadn’t been in years or decades. It was a lovely day of tea, meeting new folks, and sharing space with a whole new culture. Ally and I connected with several folks – Jonathan, who was a traveler at heart and was glad to meet some like minded folks in his neck of the woods; Jody, who was a craftsman and loved talking about building things with me; Dee, who is the mother of my friend John in west Texas and loves these kinds of things; Dee’s grandsons, John and Andrew, who I had fun beating at Ping-Pong and talking stories with; Glen, who hadn’t been to the Cosmic Shed in 40 years, but came out because the tea bus was there; and so many more. Andrew, Guisepi’s eyebrow, and Cindy. After the tea party slowed down, Ally and I went for a walk and discussed the culture we had entered. When some of the first folks arrived that day, immediately plastic shot “glasses” were brought out, with Fireball, cigarettes, and eventually some KFC. I was a little confused by all this, as the Shed seemed to be a somewhat liberal place with open-minded people. 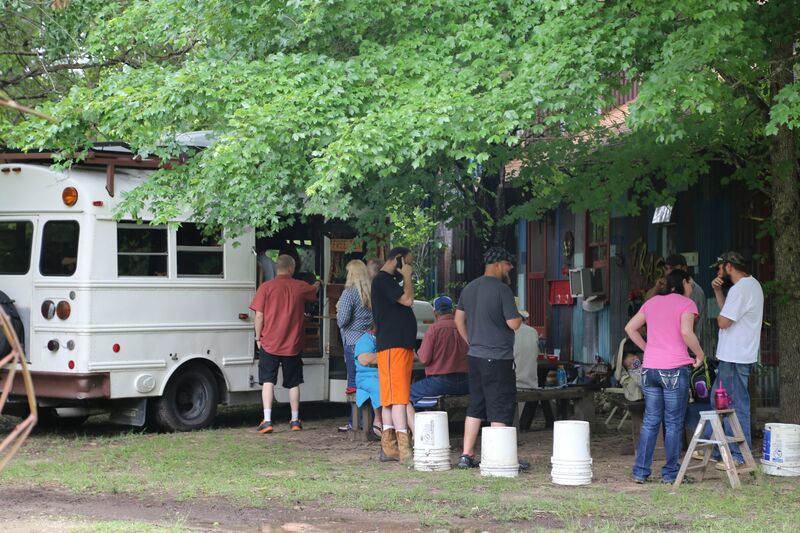 Even though so many of the folks there are liberal, and might be called “hippies” by east Texas standard, I realized that they were all folks who still operated within the confines of east Texas culture. Even when one wants to live better, open their mind, be healthier, and live in community, there are many things that get in the way in a cultural sense, but that overlaps into the physical reality as well. What I mean by this is that you can’t really buy much in the way of healthy food, or socialize/build community without booze, or get away from the throwaway consumer framework. There just seems to be too few options in this part of Texas. Ally and I decided that we love the people out here even more for it, as they do what they can within the framework that exists. Having a small fire in Edna amongst the art. Over the following week, we spent time organizing more of the bus, making and eating good food, going on walks down the road, playing with Cindy’s dogs, and just really getting to know Cindy. She is a total sweetheart, and one of the best hosts we could have asked for. She made sure we were comfortable and fed, offered us great stories, and we talked and talked. And it’s not just us that she does this for. Cindy shows this same kindness to anyone who comes down the road to the Cosmic Shed – whether it’s the usual “Shedders,” the twice-yearly motorcycle campout folks, or people like us. And for people like us, it was easy to recognize a fellow community-builder. Thank you, Cindy! One day as Cindy was at work, a police car drove by the property really slow. “How much do you want to bet he’s going to come back?” I asked Ally. She thinks I think we’re going to get hassled more than we do. I just think that it’s best to be prepared. A couple hours later the police car pulled into the driveway. It was Constable Jimmy Skinner. “We got a call from one of the neighbors about a strange vehicle over here. Can I see some ID?” Hmmm, he’s on private property, with no specific crime to be concerned about, just an odd vehicle. “If I’ve done something wrong, I’d be happy to give you my ID.” Of course I hadn’t done anything wrong. I gave him Cindy’s number, but he couldn’t reach her because she was working. The whole thing felt odd. When I told a local later about the neighbor calling the cops, he said, “That’s a good neighbor.” This mindset that things shouldn’t change, that people shouldn’t make new friends, or have different people come over, that different is bad – this whole notion is what I don’t like. 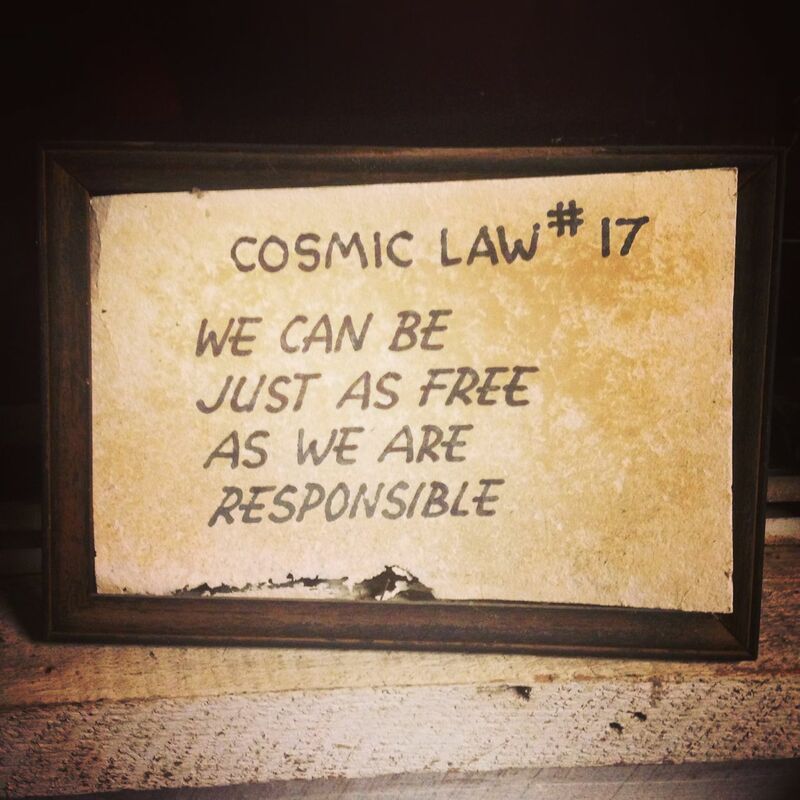 This is what Cindy is up against with the Cosmic Shed, why she’s been called a witch, and why Fred was said to have killed himself because he was a devil-worshipper. When people are closed to differences, closed to new things, closed to change, that’s when people do ugly things, and that’s when community is un-built. 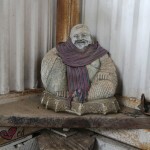 Even Buddha gets cold sometimes. And here’s where I tell you that it’s not all that bad. Cindy rarely faces this kind of discrimination, but over the years enough has happened for it to be commented on. I actually hesitated to write about some of this, because I don’t want a few instances of intolerance to interfere with what is otherwise a beautiful picture of a community hub for people who need it in east Texas. If you happen to be near there on a Sunday, I highly recommend a visit. When all was said and done, Ally, Edna, and I came out of the experience recharged. We had learned how to clean a catfish, made new friends, experienced a magical gem of east Texas, and felt utterly refreshed. 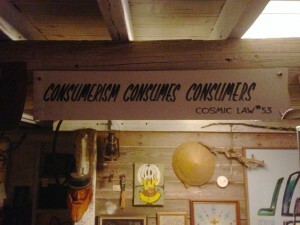 As we were leaving, Cindy told us that we had recharged the Cosmic Shed batteries too. 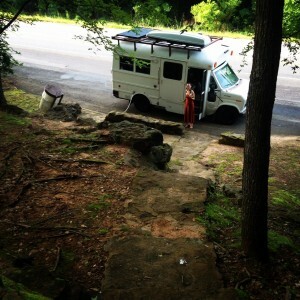 Next stop… Hot Springs, Arkansas! Gathering fresh drinking water at the Frankston Spring for serving tea at The Cosmic Shed. 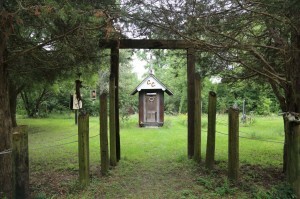 Edna and The Cosmic Shed recharging each other. 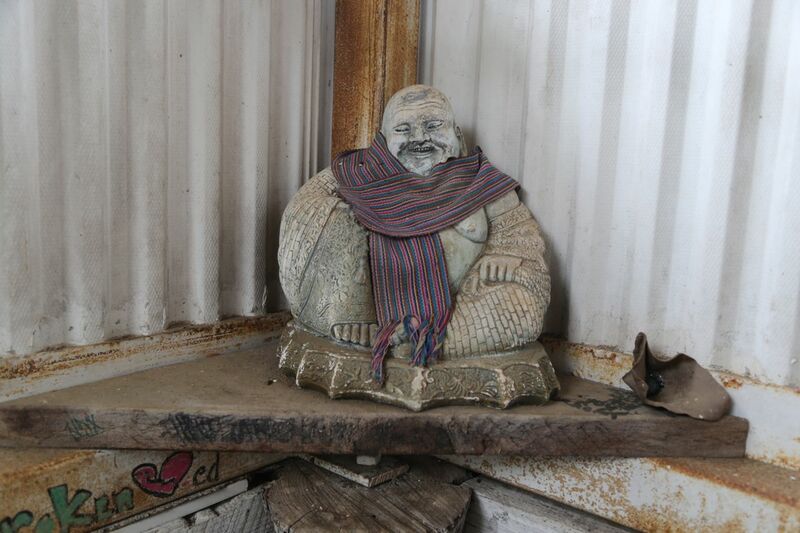 This entry was posted in Events, Journeys and tagged art, East Texas, Henderson, police, salvage, salvaged art, The Cosmic Shed, TX. Bookmark the permalink. Where is this located, I want to visit it onSunday afternoon. Hello Eloise. I’m glad you’re interested in this wonderful place! I grew up and still live in East Texas and have visited the Cosmic Shed many times. I hate that you chose to judge ETX based on a few people that chose to drink alcohol and smoke a cigarette. 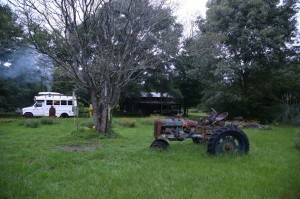 Did you not visit any of the local farms and enjoy the fresh produce? Did you stop by one of the many berry patches and pick fresh berries or one of the orchards? Did you visit any of our local farmers’ markets? I hope someday you will return to ETX and perhaps change your opinion. Also, the fact that law enforcement is concerned about a “strange” vehicle being there IS a good thing. It does not mean that we are closed to community or that we do not think people should visit others. It means that, given the many instances of vandalism and harassment in the past, people in the community ARE looking out for each other. 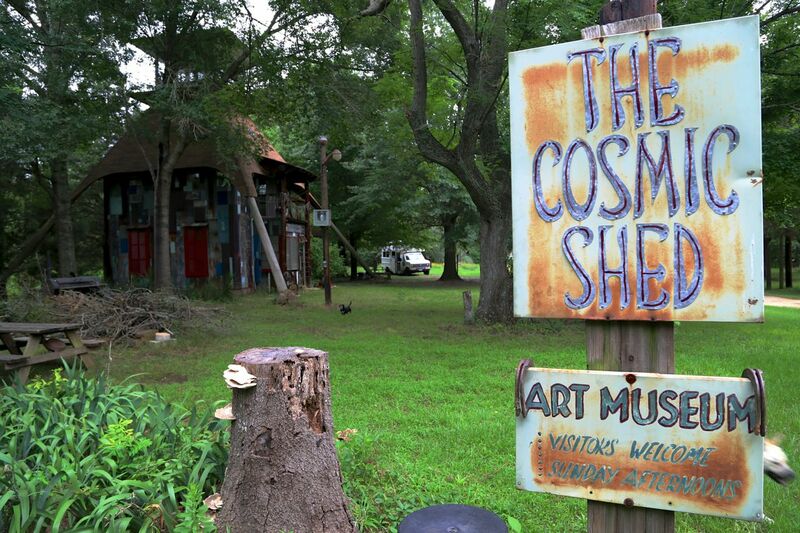 I love the Cosmic Shed, and I love East Texas. I was very disheartened by your opinion. Thank you for your comment. 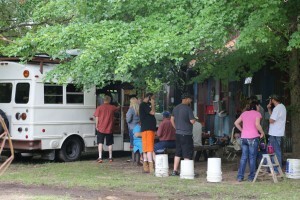 I certainly hope you don’t think that I was condemning East Texas in any way in my blog entry. My observations are definitely only from spending just over a week there. The booze/cigarettes as a backdrop to social gatherings is something that I don’t care for in American culture in general. 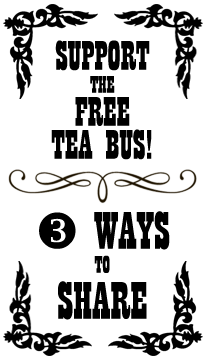 In that regard, what I experienced in East Texas is pretty much a norm across the country in many circles. In no way does it force me to judge East Texas more than I already judge the rest of America. On a side note, judgement is simply drawing conclusions from available data. Where judgement turns bad is when we condemn people from that judgement. My blog entry specifically states that “we love the people out here even more for it, as they do what they can within the framework that exists.” There is no condemnation here. Most of the food-related comments were based on what local people told me were the options for real food (organic, local, etc. ), and not just from my own experience. I also spent quite a bit of time in nearby Arkansas, and was quite honestly disappointed by the food at the farmers’ markets. Most of it was tasteless, grown in dead soil, not-organic, etc. It was cheap though! I would love to be shown some good food in that part of the country! (I do believe it exists). Thank you for pointing out that there is some! As far as the police are concerned, I have no doubt that the police wouldn’t have been called if my bus was a “normal” car or truck. The pure fact that the police were called on my bus proves my point — that closed-mindedness is what brought the cops there. 99.9% of people vandalizing/harassing are going to show up on a normal car/truck, not a bus. If it were really the case that people were looking out for their neighbor, they would be calling the cops on any new car or truck that arrived at anyones house. Yes, neighbors should definitely look out for one another, but how about simply calling your neighbor to make sure everything is okay? Calling the cops as the first step seems a little drastic. Community works better when people communicate with one another (hence the same root word: comm = move together/shared by all). The neighbor that called the cops is one that tends to be nosey and dislikes a lot of what happens at the Shed. 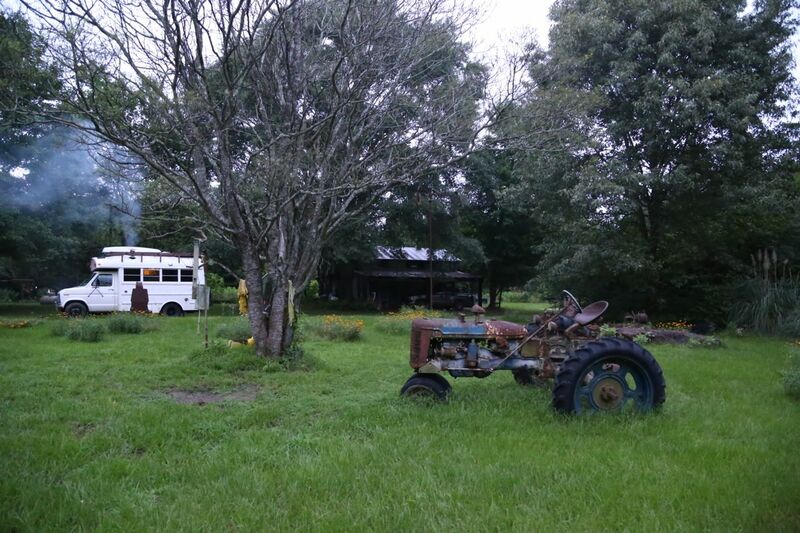 Her inability to call Cindy tells me that she doesn’t actually care about Cindy and the Shed, she simply feels uncomfortable with a “strange” vehicle in her neighborhood, and wants to exert what power she has to be nosey and try and control the situation a little. I do hope to make it back to East Texas again. Perhaps you can show me the beautiful things you love about that area?